This Bentley Continental GT scale replica with all of the authentic Logos, LED lights, sounds and all other functionalities your child can dream of. It features a Full Function Remote Control for parents whose kids cannot yet reach the foot pedal or otherwise maneuver the car. It can be fully operated by child using steering wheel/foot pedal or driven by parent via four-way remote. 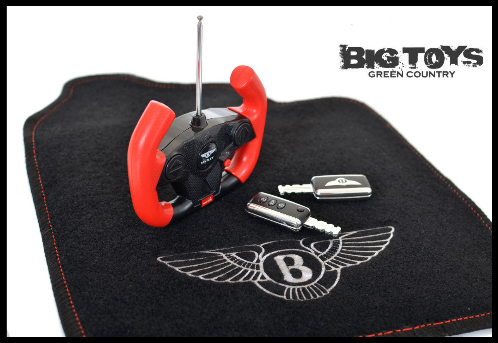 This Bentley GT toddler car comes with a beautiful paint job and custom plush floor mat with Bentley logo embroidered in it exclusively from Big Toys Green Country. It comes complete with a 12V battery and charger. My son received this car in white for Christmas. It's sterdy and looks exactly the way it does in the picture. The only issue we have is his seat comes up if he tries to get up while strapped in. I'm not sure if that's a product issue or an installment issue; we're still trying to figure that part out. If that's our fault, I'd give them 5 stars. The customer service was also awesome. When I first saw the item, it wasn't open for purchase yet. I called and let them know I wanted it for Christmas, and they opened the item and allowed me to purchase it. I love this company and will continue to use them in the future! Click the button below to add the Official Licensed Bentley Continental GT Ride On 12V Car w/ remote control -White to your wish list.